MyBusinessCatalog Free is an application that was built to help you design electronic catalogues and burn them to a CD, DVD, or Flash card. The interface looks a little intimidating at first, but a quick look at the help menu can help get you through any issues you’re having. It comes equipped with an animation editor that allows you to set the time and pick your rotation angle and resolution, allows you to quickly and easily undo any unnecessary adjustments, and gives you the opportunity to import your price lists from a wide variety of formats. It’s exceptionally efficient at helping you get your electronic catalogue out in almost no time at all. - Gives you the opportunity to create a fully functional online store quickly and easily. - An import wizard for retrieving data from a wide variety of sources (MS Excel, Access, DBF, TXT, CSV, XML, etc.). - Allows you to arrange your various products into groups and subgroups. 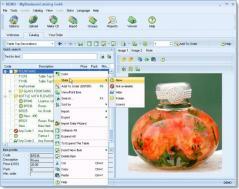 - Gives you the ability to enter various photographs, charts, and/or diagrams with ease. - Quick and easy entering and editing of detailed descriptions. - Enables you to add flash movies to your online catalogue(s) if you’d like. - A handy new and company information page so that your customers can always keep up with what’s new. - A reliable order creation/submission/printing system that can end up saving you a ton of time. - Equipped with support for multiple offices for the easy consolidation of orders.